In the flag history section, the last name is wrapping to the next line. 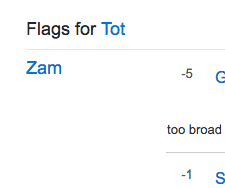 This is causing the flag breakdown counts to be pushed to the bottom of the page, under the paging section. In response to @CodyGray's comment, I am seeing this problem in Chrome on both Mac and Windows, yet it looks fine in Firefox. I inspected the element, and for some reason when I comment out the font-weight: normal css line, my username goes back to one line. I don't know why this is affecting it. 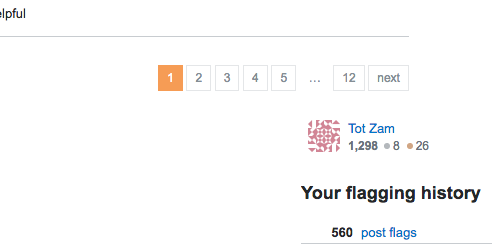 Browse other questions tagged bug design flag-history .